1Open Evernote on your mobile device, and tap the Text or New Note icon. A new text note is created. 2Tap Note to enter a title. If you don’t change the title, your note will be saved with the title of your phone’s photo collection. 3Below the note’s title, tap the notebook icon to select the notebook in which the note will be saved. You can also create a new notebook at this point by entering a title into the gray box at the top of the screen that says Find or create notebook and clicking the plus sign to the right of the notebook’s name. 4Tap the icon that looks like a framed picture on the bottom menu bar. Your device’s photo collection opens so you can see every picture that’s currently saved on that device. 5Select the photo you want, and tap Use in the top-right corner. The selected photo is saved into your new note. 6Repeat Steps 4 and 5 to select as many pictures as you want. 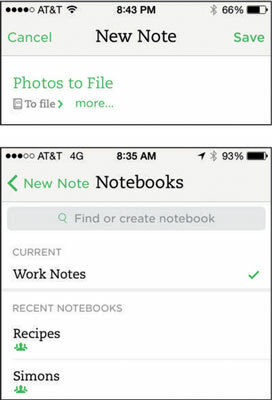 You can select up to 25MB in a free Evernote account or 100MB in a Premium or Business account. When adding images from your phone’s photo collection, you can choose to attach multiple images to a single note or create a note for each image. To select multiple images, tap the Select link in the top-right corner of the photo collection screen, tap the notes you want to include, and tap Done. If you decide to make multiple notes, the title, notebook, and tag settings associated with the note you’re creating are applied to all the new image notes automatically.